Dr. Hanif Asaria and the team at Calgary Dental Centers provide solutions for patients who are faced with these problems at inopportune moments. He offers same-day appointments for many situations in which patients can call and get in for comprehensive care the day an incident occurs. Patients who call afterhours can often receive instructions over the phone to care for the smile until they are able to come in during business hours the following day. This may include a prescription medication to address pain or an infection until patients can be seen by the dentist for assistance. Some situations may require the patient to visit an emergency room if they are unable to get into the dental office, including trauma and injury to the soft tissues of the mouth or a knocked-out tooth. What if I’m not a patient at Calgary Dental Centers? Dr. Hanif Asaria is proud to offer emergency dental services to new patients who are not currently attending dental appointments at his office. At Calgary Dental Centers, we want patients to have a professional they can turn to in a time of need. Whether you’ve visited for years or have never stepped foot in our practice, we can still provide same-day services for you and your family in your time of need. We provide the assistance patients may not be able to receive at their current dental practice thanks to our ability to provide emergency dentistry. What are some emergency treatments that may be provided? When patients come into our office with a dental emergency, we ask them about the problem they are having and provide a thorough evaluation. This evaluation gives us the opportunity to ask about a patient’s dental history to have a better understanding of what treatment may be most appropriate for their specific needs. Dr. Hanif Asaria finds that the treatment is dependent on the problem at hand. For example, a patient with a severe toothache may have a large cavity. This can be addressed with a filling. However, cavities that are too large and have infected the dental pulp may not be improved with a filling, and these patients may be better suited for root canal therapy. Each situation is different, so it is essential that patients get a thorough examination performed when they arrive to decide the best possible treatment. Broken restorations may require full replacement if they cannot be repaired, and this can also take some time. Dental crowns, for example, can take two weeks to be created at an outside laboratory. 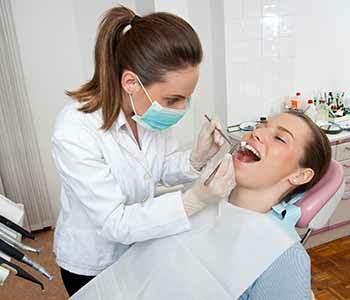 Our dentist will place a temporary while patients wait for their final repair to be complete. How much does emergency dentistry cost? There is no set price on emergency dental care because every situation is different. We want patients to know that we are here for them when they need us, and we can provide services when required. The last thing we want is for patients to avoid necessary treatment because they are fearful of how much it will cost. Our front office team can work with individuals to develop payment plans if the budget is tight. We want to make sure all treatments are attainable for patients, even those who are unable to pay in full with cash for their services the day of their appointment. Do you require immediate emergency dental services? Contact the office of Dr. Hanif Asaria in Calgary, AB to discuss your options for immediate dental care in his practice. Call (403) 768-1339 and visit the office at 127-12100 Macleod Trail SE or call (403) 768-1343 and visit the office at 10 -5315 17 Ave SE.